Most yogurt available in grocery stores are full of sugar, gelatin and modified milk ingredients. That’s why it’s important to read the nutritional information. If you compared low fat yogurt with the natural variety, you’ll notice that most low-fat versions actually contains more sweeteners and additives than their full-fat counterpart (9,10). Although they may be lower in calories, non-fat or reduced fat yogurts don’t give your body the same satisfaction after eating, meaning that you’re more likely to crave another snack within an hour or so of your yogurt. This is because fat helps keep you full and takes longer for your body to digest than carbs. It also release cholecystokinin, a hormone that regulates satiety (11,12). Replace with full fat organic yogurt or kefir, which both contain hunger-busting fats and gut-healthy bacteria. For more texture and flavor, add oats, ground flax seeds and fresh berries and let it soak overnight. Granola bars can really supply a big boost in energy, but it always comes at a cost. 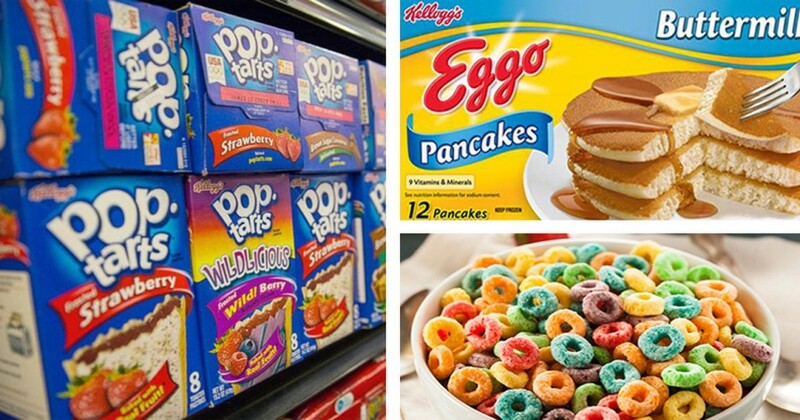 Popular brands rely on high fructose corn syrup and other corn products and sweeteners in most of their products. For example, Nutri-Grain Fruit & Nut Cherry Almond granola bar contains corn syrup, sugar, fructose, dextrose as well as naturally sweet ingredients like dried cherries, raisins and dates (13). Other Kellogg products, like Nutri grain’s Oat Harvest Bars list sugar as the second ingredient, meaning that it’s surpassed in quantity by oats alone. These bars also include corn syrup, molasses, invert sugar and more sugar and corn syrup in their filling (14). Replace with raw homemade granola bars or energy balls. Just be sure to eat them as a mid-morning snack and fill up on a full breakfast before starting your day. Processed gluten-free foods often substitute gluten, a combination of proteins, with starch, a carbohydrate (15). This means that gluten-free product often have a high glycemic index and cause a rapid rise in blood sugar levels. This leads to a rise in insulin , which can cause rebound hunger, weight gain and insulin resistance (16). Replace with naturally gluten-free breakfast quinoa. All you have to do is cook some quinoa in the morning and add your favorite nuts and fruit just before taking it off the heat. For a more creamy meal, add a tablespoon or two of coconut milk. Bacon may be the most popular breakfast food, but it certainly isn’t the healthiest. Full of nitrates, sodium and preservative the popular meat has attracted more scientific scrutiny. Studies show that just 6 strips of bacon a day can leave you 57% more likely to suffer from pancreatic cancer (17). It’s also linked to bladder, esophageal and stomach cancer. Replace with eggs, which are high in protein and good cholesterol. If you’re looking for something with a similar taste, try dulce seaweed. Coffee creamer typically contain genetically modified corn syrup, trans fats, artificial flavoring and the list goes on. Often times, inflammatory oils like soybean and canola make up the third listed ingredients while cancer-feeding sugar is the second ingredient (18). This makes coffee creamer more closely resemble a candy bar than cream. Replace with coconut oil or coconut milk. Coconut oil more closely resembles non-dairy creamer while coconut milk is closer in texture to real cream. Both can be spiced and sweetened for a guilt-free treat!